What could possibly make a family road trip to the beach more exciting? Red Vines! Summer is all about road trips and road trips are all about tasty snacks. 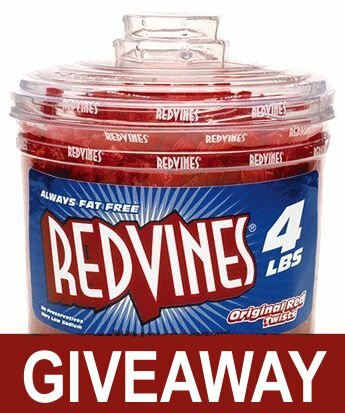 To make your road trip more enjoyable, the fine folks at the American Licorice Company (makers of Red Vines) have teamed up with us here at Candy Addict to give away a carful of Red Vines (48 lbs of Red Vines, to be exact) to one lucky winner. To enter, tell us your best (or worst) road trip stories. Did your dog get stuck under the seat? Did you meet Madonna at a gas station? Did you spot Bigfoot while driving through the mountains? Tell us your best road trip story and if yours is judged as the best, you will win a carful of Red Vines! To enter, just leave your story in a comment below before September 3, 2007! Be sure and use a real email address that you actually check so we can contact you if you win! Entries will be accepted until midnight EST September 3, 2007. Winner will be notified by email. If the winner does not respond to the email within three days, the winner will forfeit the prize and another winner will be chosen from the other entries. Giveaway is open to U.S. residents only. Void where prohibited. UPDATE: Congratulations to Anastasia (comment #1) – she was chosen as the winner! The Red Vines are on the way! Easter Candy Giveaway: Pastel M&M’s! I won concert tickets and a chance to meet singer / songwriter Mike Doughty (formerly of Soul Coughing). The concert was in Chicago, a three/four hour drive away. My husband and I invited a friend along, and off we went to the show… in a beat up car that leaked oil (so it was smokey), one headlight was out…. and… yes, the tags on the license plate were expired. But what did we care! It was MIKE DOUGHTY! We find our way to the O’Hare airport parking lot and hop a train into town. We’d never been on a train before, nor had we been to Chicago, so it was exciting! And, unsurprisingly, we got lost. …Then our smoking wreck drew the attetion of the police. We were pulled over, questioned about our broken headlight and smokey car, then let go with no ticket! RELIEF! Now let’s get home! Unilt a state trooper pulls us over. My husband is arrested and taken to one town, while my friend and I hitch a ride with the tow truck guy to anther town, where our car was impounded. We waited eight hours in a gas station phone booth for friends to come and pick us up. My husband was booked and released, so he spent his eight hours in a small town police station. I’m not a US resident, but this is an okay story. It was the summer before I started Junior High, and my parents and I went back to Massachusetts, from Nebraska, to visit my dad’s family. On the way back, they decided to swing through some of the South, and we hit the Virginia Turnpike. The Virginia Turnpike is long. And there are no rest stops for huge stretches. We didn’t know it at the time, but my dad was diabetic, so he kept stopping to urinate. Unfortunately, while the slightly wooded area at the side of the road was good for a guy to pee, it wasn’t secluded enough for a nearly 12 girl or her mother. So we had to wait. We finally get to the end of the turnpike. My mom and I are nearly bursting, me more than her, from the need to pee. We rush to the restrooms. One of them is under repair. Can you guess? Yep, the women’s. I went storm chasing for the first time this past June. What most people don’t know is that chasing consists mostly of driving through the nation’s armpit. Sixteen fellow chasers and myself traversed the plains from Kansas to Canada in two very crotchety Dodge Sprinters over the course of ten days. To occupy ourselves one day, one of the girls got it in her head to remover her bra and hang it out the window for the occupants of the other van to see. Yes, everyone had cracked up, but the kicker was that after we passed the van, we were alongside some other drivers. One look at the offending lingerie, and they shot us looks that said, “you people are insane”. Of course, their horrified expressions only made us laugh more. Eventually, we did see some great tornadoes–four in all. While we will continue to share details of those storms with friends and relatives, what happened while the skies were fair will remain our own little jokes. Ohhh, as much as I’d like to win 12 giant tubs of Red Vines and get to pass ‘em out to my friends, I’m about to embark on a big road trip of my own on Oct. 1st as I move to Arkansas from Arizona, and can only take what will fit in my Jetta. There won’t even be room for one tub, much less 12! So, I’ll just have to wait for the next road trip contest and by then, will have a week’s worth of great stories from this impending journey. I’ve planned to see all sorts of things, both naturally occuring (Grand Canyon, Petrified Forest, etc.) and decidedly not (Cadillac Ranch, Wigwam Motel, god knows what else)! But no matter what I see, do or experience, one thing is for sure: plenty of candy will be purchased and eaten on MY road trip! At the age of seven a road trip is a marvelous experience. Money, driving, all the other cares of traveling folk–these do not affect such a youngster. Far be it for me, a little girl, to think about anything other than the beautiful mountain scenery on the way to Oregon. I even forgot about socks. Socks! An essential commodity without which your poor feet, in the heat of a summer trip, will not be left quite so fresh. This fact was brought to my attention while sitting in the back seat of my mother’s maroon chevy. I was relaxed and journaling the sites as I carelessly removed my shoes from my feet after hours of travel. The gasps and the noises to follow from my fellow passengers were enough to embarrass me, but not enough for me to want to replace the shoes to my travel-weary feet. It seemed they were more interested in breathing than how little I cared to be uncomfortable. It seemed every rest stop from that moment on, there I was, a girl of seven, stretching my feet up over the sink to rinse my little toes of their offending odor. An embarrassing lot it was, I tried to lighten the situation by naming my offending friends “Stinky” and “Stinkiest”. It was, needless to say, a long, long car ride–a car ride that my mother, to this day, still describes in detail to anyone who dares to be a candidate for her son-in-law. This isn’t so much my story, as one involving my parents. Living in Buffalo has a lot of good points, but unfortunately those good points don’t include a lot of readily available South Asian fruits and vegetables, like mango, jackfruit, or my personal favorite, mangosteen. So, when we go to Toronto, there is mass consumption of these items, plus large scale purchases of things that one might hope to bring back in the car, even if not exactly approved by the agricultural authorities. One time, some family friends and us were coming back, car filled with pungent South Asian cooked foods, some fruits and vegetables, and a mighty odiferous stash of (perfectly legal) dried fish, which is a delicacy, but a stank one at that. When we got to the border, the family friend who was driving got so flustered when responding to “what are you bringing back into the US” he said “fruit” instead of “food” or “cooked food,” which more accurately described the cargo. Needless to say, the officer asked the driver to open the trunk and to come back there and help him search it. As soon as the trunk opened, the eau de dried fish wafted towards the officer and he saw the trunk stuffed with sinister, unfamiliar looking, and bad smelling items, and he looked at us and said, just go, please go. This is SUPER EMBARRASSING but hey, I thought I would share. When I was in seventh grade, my best friend and I found a website that send out free samples of products. We were obsessed! We signed up for everything, including depends diapers as a joke. Later that summer, we drove to disney with her father and two brothers. I had to pee sooooooo bad and he would not stop.Im usually pretty good about holding it, but this time I thought I could die. The only thing I could think of as a last resort would be to use one of the diapers. I did, in the back of the trunk, and to this day, her brothers will NEVER let me live it down! It was a crisp fall day in the Hudson Valley, my freshman year at college. Thanksgiving Day break was here and I was looking forward to my friends from home coming to pick me up. I packed my stuff and we began our trip back. A conversatioin was struck up once on the road. Oh My God, wait until you see this guy up the road. He is just standing there with a Grim Reaper outfit on, sickle and all, waving a sign that says “SIN IS DEATH’S CANDY”. I don’t believe it… Just wait, you’ll see. We roll up to a red light. This is the type of road with hundreds of red lights. What to my wandering eyes should appear…. death himself standing on the curb at a major intersection, warning off any sinner he can find. Just then something else attracts my attention. It is bright flourescent green and sloshing around on the floor. It is a Super Soaker 3000 and it is ABSOLUTELY begging for me to put it to work. An impulse strikes as we roll up to the red light at the very intersection Death was working. I pop out of the sun roof like Chuck Norris in a Missing in Action flick and totally empty the Super Soaker 3000′s huge aqua chamber all over the skeleton mask and black robes. Death is not impressed or happy to say the least. He charges the car. My friend goes to hit the gas. I lurch forward. STALL. The manual transmission has done me in. Death is now at the car. I am spewing what fluid I have left at him in attempts to thwart his car ravaging campaign. Death is saying some words that might very well put his sign to shame. Just when I think I am going to get a sickle to the brain, the car jumps to life and we book it out of there. My life flashed before my eyes but it was still pretty funny. When I was around 7, me, my mother, my Aunt, and her children were driving back from Arizona to Ohio. It was around a 3 day drive with 4 children and 2 adults. It was the middle of the night and we were driving, and us kids were asleep. There was a dead skunk by the side of the road, so my aunt asked if my mom would get the air freshener. My mother mistakenly grabbed the bug spray, and in an unfortunate turn of events, my aunt had turned to tell her that she grabbed the wrong can, and my mom sprayed some in her mouth on accident. Earlier in the day we had gotten pumpkin seeds in a gas statin, and she cut her toungue. So it was swollen to about 5 times its average size for a day or so. And then when we got close to home, we went to a carwash to get all the dead bugs off our car. The adults had left an ashtray on the roof of the car from stopping at the gas station, and once we got in, they realized it. They unrolled the windows to try and grab it, and then soap started to come in from the windows as they grabbed for it. They finally got it, and by that time, they were covered in soapy water along with the front seats! Okay, this is more of a road trip/moving combo story. When I was six, my parents helped my grandmother move from Michigan to Tennessee. During the 10 hour+ trip, my grandma lead the way in her car while me and my parents were in the moving truck. There are long strecthes of interstate where there are no rest-areas, and it was a not uncommon practice for us to stop on the shoulder of the interstate to use the bathroom. My grandma signaled that she needed to stop so we all pulled over. It was near dark, so there wasn’t much traffic. My grandma “assumed the position” on a rather steep embankment, lost her balance and tumbled down the hill with her pants around her ankles and a roll of toilet paper bouncing along behind. It’s a good thing she was alright because we were in the truck DYING from laughter. She got up, pulled up her pants, brushed herself off and made her way back to the car. We made our way to Tennessee, and she never mentioned it. We’ve been laughing about this one for nearly 20 years. One time we were driving to the mall which was about a half an hour away. But they were doing construction on the road. So they had up cones not in the middle but way over to the right side. So everyone had to drive on the shoulder. We didn’t know we had a flat, because we were just rumbling along. Then we started to lose speed, but there was no where to go, because they were working on the other side. But there was a big long line of cars behind us. So we just pulled on to the left side. Way up ahead of us we saw big machines coming toward us! We were all freaked out. Then my mom made my 15 year old brother go out and look at the tire. It was completely torn up. There was nothing to do.So we tried to call my grandpa, but it was busy.Then we called my dad. He was at a business trip in Salt Lake. He told us to try to take the tire out and put in the doughnut. But right then the big machines were about 20 feet away from us. We were so scared. Then the stopped about 5 feet away, and came and changed our tire. First there were only 2 men. Then 5. Then 7. And before we knew it there were 13 guys coming to change our tire.It was cool. So I guess we got a good and bad car trip. Flat tire, no where to go.Then cute guys! All I have to say is 3 year old “twins”. This year we decided to take a trip from Chicago to the Lake of the Ozarks(with boat in tow) with our 5 kids and in laws. Drive took 11+ hours. Had one twin sick on the way there(with a virus that could not be treated)and then the other twin had it on the way back. Needless to say traveling with a feverish 3 year old is unpleasant in itself. Add in the fact that the boys are in a “I said” stage so most of the trip(there, back and during) all we heard was “I want to go home” and the reply of “I want to go to the water”…..this went on for hours and usually turned into a screaming match. Home never felt so good! Luckily we had our licorice to keep us sane! Many years ago, 1976 to be exact, we were planning a trip from our home in Maryland to visit my grandparents in West Virginia. We only had one vehicle at the time, a beat-up Ford F-150 pickup truck, and there was no way that my parents and three teenage boys could all fit in the cab of the truck for that 8 hour drive, so my dad decided to buy a new car. My father is a very patriotic veteran and 1976 was a very good year for patriots, being the bicentennial of the USA and all. As my father drove past the local AMC-Jeep dealer, he spied a beautiful special edition AMC Gremlin decked out in red, white, and blue and that was that â€“ he had to have that car. Without giving much thought to the real needs of a vehicle, my dad traded in the truck and quickly closed the deal on this Gremlin. I remember how he was smiling when he pulled into the driveway, prouder than a peacock to be driving around in a virtual flag of the USA. My brothers and I, on the other hand, saw beyond AMCâ€™s trumped up marketing ploy. We saw the back seat. For those that donâ€™t recall (or never knew), the Gremlin was classified as a â€œcompact carâ€, a very ugly, very compact car even though it was simply ahead of itâ€™s time. In any case, there was no way that three large teenage boys were going to fit in that back seat. My mother, the consummate diplomat, oohâ€™ed and awwâ€™ed over the car with my father, politely listening to his description of each gadget on the carâ€™s dashboard. After a few moments though, she turned to look into the back seat and asked â€œwhere will the boys sit?â€ In retrospect, I should have never doubted my dadâ€¦he has always been the smartest guy I know. He jumped out of the car and ran around to the back and popped the hatchback and said â€œAll the bags can go on the roof rack, Little Joe can ride back here.â€ â€œHereâ€, of course, was the small cargo area behind the back seat. â€œLittle Joeâ€ was my younger brother but there was nothing little about him. At 12 years old he was already man-sized and playing defensive noseguard on the local middle school football team. My older brother Earl and I began to laugh, knowing that Dad never changed his mind once it was made up. Little did we know, the back seat was hardly designed to accommodate two large young men. This was the time before required seat belts and air bags. No one had a second thought about a kid riding in the boot of the car. It kind of makes me wonder why Dad didnâ€™t just keep the truck and throw us in the back like he did when we rode around town. Even so, my mother rolled her eyes and said â€œThose boys canâ€™t fit back there for 8 hours, they will kill each other.â€ My father responded that we would ride there and we would be happy doing it or he would settle us right down. We knew that meant a belt across the bottom â€“ still legal in those days. He hollered for everyone to get packed up, we were leaving at dawn. Dawn came early. With his standard flip on the light and full volume â€œGET UP NOW! !â€, my dad called reveille. It turns out my mother had been up for some time already because a full breakfast, normal for my house, was laid out on the table. Along with breakfast was a packed picnic lunch and enough snacks to feed a small army or three teenagers, whichever found the food first. As we loaded the car, it was obvious that the food couldnâ€™t go on the roof rack so it was stuffed in through the hatchback to take up some of that precious space. My mother graciously placed the drinks in the area at her feet. And we were off. The first thing I learned was that the curved sides of a Gremlin take away a lot of much needed shoulder space. Earl and I were basically tilted towards the center of the car by the outside walls. This, of course, obstructed the view of the rearview mirror and so we are an immediate nuisance to my father before we even left the driveway. â€œMove your headsâ€ became a mantra for my dad over the next hours as he scanned from mirror to road to mirror in the manner of a professional driver. Little Joe actually seemed the most comfortable kind of laid out in the hatchback area of the car. I thought he had fallen asleep immediately since I heard nothing from the back and it wasnâ€™t worth the trouble to try and turn around to look. But then I smelled itâ€¦fresh biscuits. We were no more than 5 minutes away from home, 15 minutes away from finishing breakfast, and Joe had already broken into the snacks. The car filled with the aroma of Momâ€™s biscuits. My mom said â€œJoe, you put those away, those are for later!â€ My dad said â€œHey, Little Joe, send me up one of them biscuits with a chunk of bacon on it.â€ You can guess who won that argument. In any case, all of the snacks were gone before we got out of the county and we had a long day ahead of us. The trip was pretty inconsequential for the next few hours. Until lunch time. We had made good progress on the road, less so in the car. We had made a major run on the lunch bag and there were just a few sandwiches left by lunchtime. My dad was angry because it was obvious he would have to buy lunch (even though it was mostly his fault). We were near Morgantown WV on what used to be I-48 around noon. There was a rest area sign and Mom told Dad she needed to go. With a sign of resignation (this wasnâ€™t our first stop), Dad pulled in. As Mom headed to the restroom, we peeled ourselves from the sardine can backseat. As we stood around, a panel-type truck pulled up and a few people piled out of the cab. The side of the truck said â€œJoseâ€™s Cantinaâ€ in a loopy script. My dad walked over and I saw him talking to the driver and then they both went to the back of the truck. A few minutes later he came back carrying a box and said â€œBoys, grab some drinks and letâ€™s go over to that picnic table. Earl, grab the rest of that lunch that your Mom made.â€ So we were off. It turns out that Joseâ€™s special of the day was fried chicken and Dad had bought a mess of it. Mom came out and we waved her over. She seemed relieved that Dad was satisfied with his lunch purchase. Jose had thrown in a few handfuls of some chewy taffy like candy wrapped in wax paper, obviously homemade. The chicken didnâ€™t taste anything like Momâ€™s fried chicken but we figured that Mexican fried chicken was as good as any. We wolfed down the chicken while Mom ate her sandwich. We passed around the taffy but Mom said it didnâ€™t â€œlook cleanâ€ whatever that might mean so she threw it all away. We cleaned up our mess and piled back into the Gremlin. Three more hours to Grandmaâ€™s house! No sooner than we got on the interstate than Little Joe moaned out â€œMom, I donâ€™t feel good.â€ â€œWhatâ€™s wrong?â€ â€œMy stomach hurts.â€ Dad chimes in â€œYou probably ate too much, lie back and be quiet.â€ That was Dadâ€™s standard diagnosis when we were on the road. Five minutes later, Joe hollers out â€œMom, I think I am sick.â€ To Dad she says â€œMaybe you should pull over and let him get some air.â€ â€œNaw, were behind schedule, heâ€™ll be alrightâ€¦â€ just as we heard that noise that you never want to hear inside a car, especially a new small car with many hours of travel left. â€œYaaaakâ€¦bwuuuuukâ€ came the sounds from the back. Dad maneuvers to the side of the road as quick as he can. Out he jumps, pops the hatchback and drags Little Joe out. Mom is out, tissues in hand, wiping his mouth. Joe looks white as a sheet and yaks up something greenish on Dadâ€™s shoe. My dad never cussed but I could tell he was real close. Like he was thinking about what the right cuss word is to use if you are going to start cussing right this second. But he didnâ€™t. He just looked in the back of the car at the mess. Mom took Joe over to the berm and they sat down on the roadbank. â€œIs he OK?â€ asks Dad. Mom has her hand on Joeâ€™s forehead, the standard check for all kidâ€™s illnesses or diseases. â€œHeâ€™s sweating but I think he will be OK.â€ Back in the day, Moms were much better at quick and official diagnoses. Today, such a diagnosis would take twelve tests, three opinions, and two days. I lay back, struggling to keep my mouth shut. Everyone else climbed into the Gremlin and closed the doors. Dad hit his signal, checked his mirrors and made ready to merge. Then he stopped, stared straight ahead for about 10 seconds, threw the car into park, whipped open his door and blew fried chicken at the side of the road. He climbed out and walked around the car, bowing over and letting loose with huge loud primal grunting scream-like sounds while puking. I was always impressed with how much effort my Dad put into vomiting, as if he could make more noise then he could clean it out faster. From my perch in the back I saw him drop to his knees on the roadbank. I told Earl to let me out the back, he told me to shut up. Mom was by Dadâ€™s side with some napkins and a jug of water. I was a pretty quick thinker back in those days and I was thinking now that we had had some bad chicken. After a few minutes, Dad got up and you could tell the bout had taken a lot out of him. It is never good for a child to see his father looking weak and pitiful, especially from the fatherâ€™s point of view. Mom asked me and Earl how we were feeling â€“ Earl said â€œOKâ€, I said â€œI think Iâ€™m going to pukeâ€ only hoping to get out the back of the car. Dad walked around and opened the hatch, saying â€œPoint it out the back here if you have to.â€ At least the air was better. We sat there for a while longer. Mom and Dad discussed getting off the highway to look for a doctor or a hospital. They decided it was best to head on towards â€œhomeâ€ â€“ which meant Grandmaâ€™s house â€“ and just call ahead from the next gas station to see if Dr. Wilkens could see us when we got into Grandmaâ€™s town. It was clear that Dad wasnâ€™t going to drive, which left Mom of course. That was scary under most any circumstances but in this overpacked smelly car with all the stress about her sick family, I knew this would be an interesting ride. With the hatch battened down and the windows wide open, we were on the road again. Dad and Little Joe were asleep within minutes, Dadâ€™s resounding bear snore coming from the front seat. I have never figured out how he can sleep with all that noise. Mom told me recently that only Valium allowed her to sleep all those years. Looking back, I can see why. Momâ€™s approach to driving is to grip the wheel at 10 and 2 and focus on the road ahead. Thatâ€™s it. Never pass a car or truck. Go as fast as the vehicle in front of you, maintaining plenty of safe distance in between. It is the most passive driving that I have ever seen. We must have been averaging about 40 mph (speed limit in those days was 55 mph). The three hour trip stretched into eternity. I was in and out of dreams about Gilliganâ€™s Island, trying to decide between Ginger and Mary Ann but knowing I would never get off the island. We plowed on down the road. Some hours later, we pulled off the road for gas. As the man pumped the gas, Mom went to make the phone call. There was a store nearby and Mom went in and bought some cleaning supplies. We scrubbed out the back and traded the softening putrid smell for an intense headache-inducing Lysol smell. Dad and Little Joe went into the restroom and washed up, returning looking somewhat normal. Dad asked Mom if she wanted him to drive and she said no. He looked relieved at that. That told me that he wasnâ€™t all the way back up to par. It was a pretty weird scene but thinking back, it was pretty special â€“ Mom driving and singing, the wind swirling through the car, Dad sitting there looking at Mom, all of us heading to Grandmaâ€™s house. I can still smell the Lysol. Hours later when we pulled up into Grandmaâ€™s yard, there was a crowd waiting for us. Dr. Wilkens was there along with one of his nurses that had been Momâ€™s friend growing up. A variety of aunts and uncles and cousins were waiting around to see us before they hauled us off to die. It turns out Momâ€™s phone call from the gas station had been more alarmist than necessary and Grandma had called out the troops. They had been waiting for some hours now and everyone was on edge. Dr. Wilkens took charge of Dad and Little Earl, with Mom and Grandma trailing behind. My uncle Jim helped me out of the car and begin helping me towards the house like I was an invalid. Earl climbed out and followed. As we walked into the house, Aunt Martha grabbed us and said â€œYou must be famished, come into the kitchen. We got dinner all ready and waiting for you.â€ As the kitchen door opened, you already have guessed that the kitchen table was pile high with fried chicken with all the fixings. Earl and I turned and ran out of the house as fast as we could and we slept in the barn that night so that we didnâ€™t have to smell the fried chicken smell in the house. All in all, a pretty good â€“ and memorable â€“ road trip to Grandmaâ€™s house. There is more to the story because the return trip was just as crazy with some kids egging dadâ€™s new car and him chasing them down and making them wash it and having the police stop by to see what was going on â€“ very interesting but I have to save it for another time. I won tickets to meet a famous singer and to go backstage. I went to the airport and found out that the tickets they sent me were fake. I called the people who gave me the tickets but they did not want to anwser. I was really mad. I instead told my friends, family, and people I knew not to call the place (I do not remember) ever. My friends aunt told me that she called there and she actually went to the concert. She also went backstage. This was not FAIR!!!! I decided not to call any stations, any tv stations and especialy computer winners. During Spring Break of (I think) 2001, my family decided to take a trip to Death Valley, one of the hottest places in the world. The idea was that, it being only April, the weather would not yet be unbearably hot. Well, Death Valley was an interesting place (really! ), but it really was unbearably hot, s we gave up and decided that the last night would be spent in nearby Las Vegas, in a nice, air-conditioned hotel room. Near the California-Nevada border, we stopped at a shop for a rest break. The shop was selling a lot of fruits and veggies. I picked up a bag of salted, dried peas, among other things; the peas were a delicious salty snack, and I ate them en masse. Later that night I was walking The Strip with my family when the stomach pains set in. I can’t recall ever having stomach pains that intense; they literally doubled me over, making me unable to stand up straight. Every casino that we stopped at, I insisted on going into the bathroom, but such visits were unproductive and the pains just wouldn’t go away. I’ll try to keep this short and simple – but I went out to California from the midwest to go to college. While I was out there, my car a 2 door Mazda RX-7 had one of the doors freeze up and wouldn’t open. When I came home during the summer, me and another friend had all of my stuff and the two of us in the car which was so packed we couldn’t really move . . . and to boot she had to always get out on the driver’s side of the car which looked really odd. Anyway, it was one of the funnest trips I have ever taken! so…is this over? and the winner was? ?